To achieve this, the team used two polymers they had designed, which notably can self-assemble or dissociate, depending on the conditions. This work, the result of collaborative efforts by chemists, biologists and biophysicists, is published in the 1st September issue of Angewandte Chemie International Edition. Biotechnological advances have offered access to a wealth of compounds with therapeutic potential. Many of these compounds are only active inside human cells but remain unusable because the lipid membrane surrounding these cells is a barrier they cannot cross. The challenge is therefore to find transfer solutions that can cross this barrier. By imitating the ability of viruses to penetrate into cells, chemists in the Laboratoire de Conception et Application de Molécules Bioactives (CNRS/Université de Strasbourg) sought to design particles capable of releasing macromolecules that are only active inside cells. To achieve this, these particles must comply with several, often contradictory, constraints. They must remain stable in the extracellular medium, they must be able to bind to the cells so that they be internalized, but they must be more fragile inside the cells so that they can release their content. Using two polymers designed by the team, the scientists succeeded in creating a “chemical virus” that meets the conditions necessary for the direct delivery of active proteins into cells. In practice, the first polymer (pGi-Ni2+) serves as a substrate for the proteins that bind to it. The second, recently patented polymer (πPEI), encapsulates this assembly thanks to its positive charges, which bind to the negative charges of pGi-Ni2+. The particles obtained (30-40 nanometers in diameter) are able to recognize the cell membrane and bind to it. This binding activates a cellular response: the nanoparticle is surrounded by a membrane fragment and enters the intracellular compartment, called the endosome. Although they remain stable outside the cell, the assemblies are attacked by the acidity that prevails within this new environment. Furthermore, this drop in pH allows the πPEI to burst the endosome, releasing its content of active compounds. Thanks to this assembly, the scientists were able to concentrate enough active proteins within the cells to achieve a notable biological effect. Thus by delivering a protein called caspase 3 into cancer cell lines, they succeeded in inducing 80% cell death1. The in vitro results are encouraging, particularly since this “chemical virus” only becomes toxic at a dose ten times higher than that used during the study. Furthermore, preliminary results in the mouse have not revealed any excess mortality. However, elimination by the body of the two polymers remains an open question. The next stage will consist in testing this method in-depth and in vivo, in animals. In the short term, this system will serve as a research tool to vectorize2 recombinant and/or chemically modified proteins into cells. In the longer term, this work could make it possible to apply pharmaceutical proteins to intracellular targets and contribute to the development of innovative drugs. This work was made possible by the collaboration of biophysicists and biologists. The skills in electron cryomicroscopy available at the Institut de Génétique et de Biologie Moléculaire et Cellulaire (CNRS/Université de Strasbourg/Inserm), and the expertise in atomic force microscopy of the Laboratoire de Biophotonique et Pharmacologie (CNRS/Université de Strasbourg) enabled highly precise characterization of the molecular assemblies. 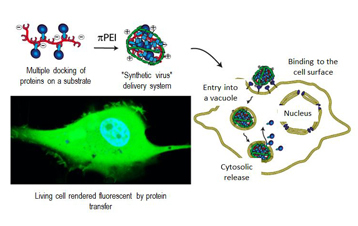 The Laboratoire Biotechnologie et Signalisation Cellulaire (CNRS/Université de Strasbourg) supplied the recombinant proteins encapsulated in the artificial virus. 1To achieve maximum efficacy, the scientists are hoping to combine siRNA (small nucleic acids that specifically target the expression of certain genes) with the proteins, and these could also be delivered using the same particles. 2Vectorization consists in controlling the distribution of an active substance to a given target by combining it with a vector. This enables delivery of a protein inside a cell via the intermediary of a biocompatible vehicle.